Retailers are in a prime position to offer educational materials to help customers make informed dietary supplement decisions. However, laws like DSHEA limit the type of dietary supplement information retailers can legally share. That is where AISLE7 products come in. AISLE7 gives retailers access to extensive DSHEA-compliant, referenced, peer-reviewed, science-based content and decision tools created by a team of experts. It's not false or misleading. It doesn’t promote a particular brand or manufacturer. It's balanced (meaning it presents the pros and cons and the state of the science). It's kept physically separate from the product. It uses official abstracts of singles studies, or summarizes a group of studies. Empower staff with relevant information about supplements, ingredients, and health concerns so they can provide a high degree of service at the point of sale. 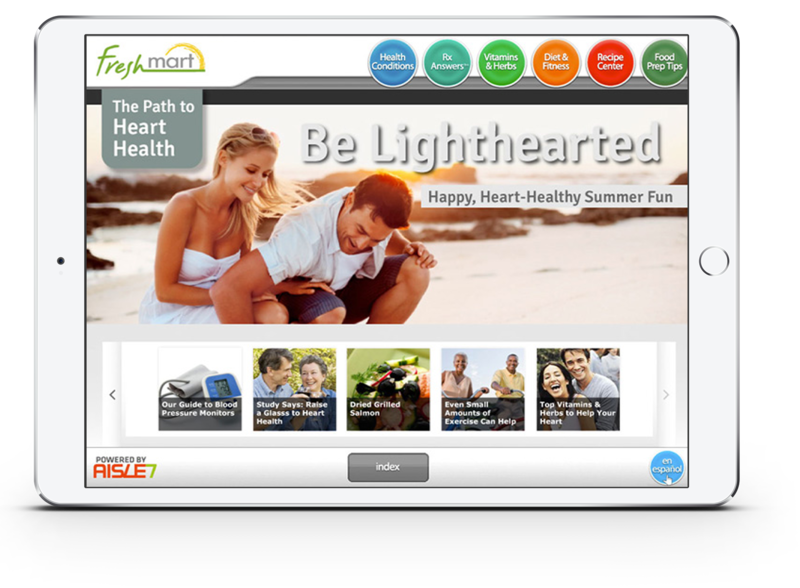 Search: Access the most comprehensive supplement database available. Newswire: Read concise news to stay up-to-date on the research and trends customers care about. Common Questions: Discover trustworthy answers to customers’ FAQs. Training: On-board new staff with ease and comfortability. Leverage the AISLE7 content archive and position yourself as a category expert for digital marketing initiatives. Health Concerns: Search our library of referenced articles on most health concerns. Supplements, Herbs, and Ingredients: Delve into our encyclopedia of the most popular ingredients with uses, dosages, and safety cautions. Newswire: Read fresh and topical news. Responsive Design: Integrate our tools into your website design and presentation. Content Explorer: Grab relevant content for marketing campaigns. Drive customer engagement and increase sales in store and online with the AISLE7 Vitamin Advisor and the AISLE7 Interactions Checker. AISLE7 Vitamin Advisor: Increase purchases by providing customers with instant, personalized product recommendations based on their answers to a short online questionnaire. AISLE7 Interactions Checker Provide customers with science-based, pharmacist-reviewed drug, nutrient, and food interactions that enhance buyer confidence. From custom content to curated science, AISLE7 has your company covered. Are You Ready To See What AISLE7 Can Do For You?